I love the way our elementary school does fundraisers. Instead of selling stuff, they have one event a year where families come to the school and buy tickets they can use to buy pizza for dinner, enter raffles, and play carnival-style games. It's not the funnest thing you could do with your family on a Friday night, but it's certainly more fun than hawking overpriced wrapping paper to unsuspecting relatives and coworkers. My 7-year-old's favorite game at this fundraiser is the Cake Walk. You walk around the school gym and when the music stops, if the number you're standing on is called you win a cake. We won a cake which sounds cool, but remember that these are cakes baked, decorated, and donated by elementary schoolers. I should've taken a picture of the one we got. It was covered in mounds of gummy worms and marshmallows, with at least $5 worth of sugar sprinkles dumped on top. It looked disgusting. I kept trying to steer my daughter toward the more edible-looking ones, but that's the one she wanted. Sigh. Freak? Yes. Natural? Not a chance. How the heck do you make less-salty salt? What even IS this? I can't wait to go back to the store next week so we can buy some real salt. This can't possibly be good for us. I usually let my 2- and 4-year-olds choose their own picture books at the library, which means we haven't read anything that wasn't about trucks for 6 months. I decided it was time to broaden their literary horizons and picked out some things from the children's section on other topics including beetles, anthropomorphized snowmen, talking cats, and a shark who wanted a hug. 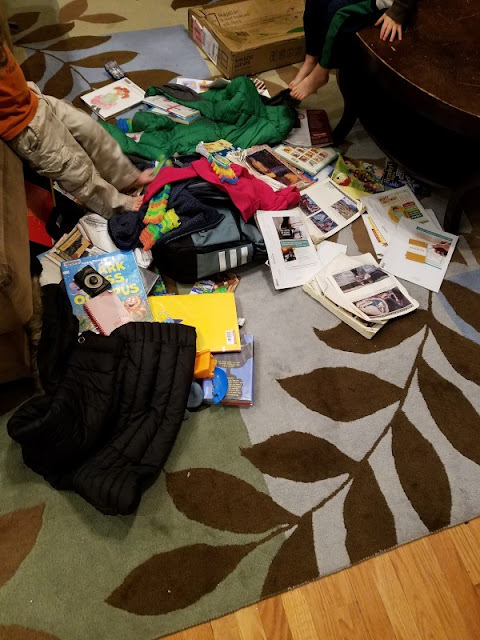 We came home and then I went to volunteer in my 1st grader's class at school, but when I came home I told my 4-year-old to go get one of his new books. 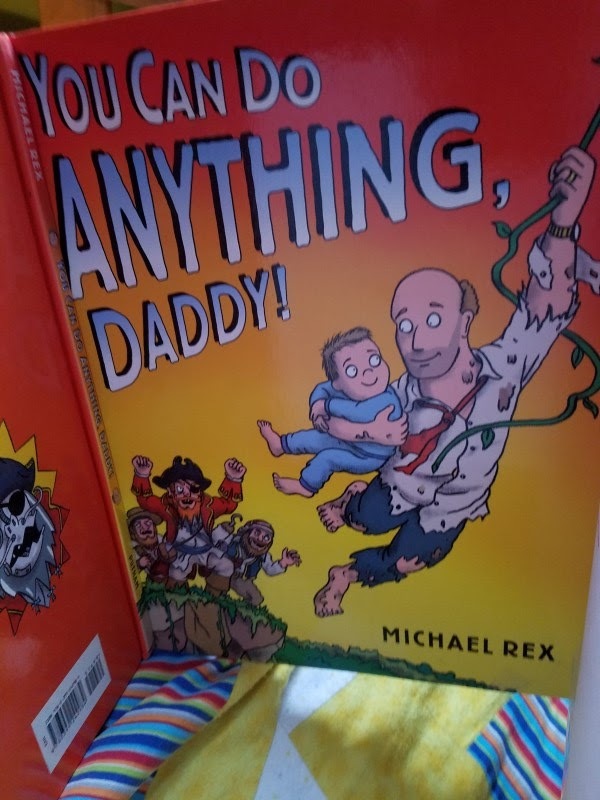 He brought me this one and said, "Let's read Dads Can Do Anything!" Basically it's I Love You, Stinky Face for dads. I'm kind of in love with it. Shrugging nonchalantly, he said, "I just readed the words." "So... Dad didn't read this to you while I was gone?" Several more times, he solemnly swore he read the title on his own and Dad had never been involved. Which Phillip confirmed was a total lie that night when I asked him about it; they'd read the book immediately after I left. While at the library, I grabbed this math book called Here's Looking at Euclid for my 14-year-old. I flipped through the pages just to give it a quick scan before I gave it to her, and I was hooked. I seriously can't put it down. I think math is boring, but examining the way we think about math (which I guess I've never even thought to think about before) is blowing my mind. Did you know numbers mean different things to different cultures? Have you ever thought about what it would be like with a base 12 number system? There didn't used to be zero, people. Think about that. My 7-year-old came into my bedroom to cuddle with me one morning. While I struggled to wake up, she chit-chatted and made random observations until suddenly she asked, "How do boogers form?" "I don't know, but we can look it up," I said. Then realizing I say that a lot but don't actually get around to looking it up all that often, I grabbed my phone and Googled her question so we could find out the answer. So, people waiting to have children because they want to be "ready:" know that it's impossible to prepare for the experience of having kids. You just can't possibly foresee that someday you're going to be lying in bed at 6:30 A.M. looking up boogers. One of my favorite things about toddlers is how they adopt the big words they hear us using. My favorite word my 2-year-old says is "actually," because it sounds so funny coming out of his tiny mouth. I gave him a hug the other day and said, "I love you." "I love you!" he answered automatically, and then said, "...actually, no." "No," he said. "I like Dad." Okay, maybe I don't like actually all that much. Our new bookshelf is finally put together, and the long box it came in was propped up by the door to go out to the recycling. 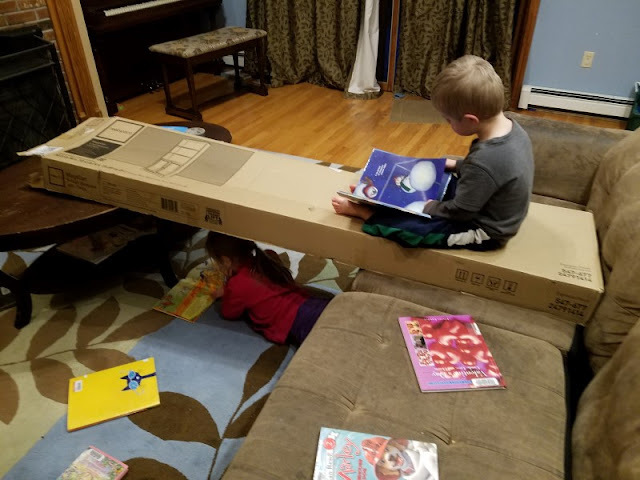 My children quickly discovered it and it became their favorite toy. First they just colored all over it. 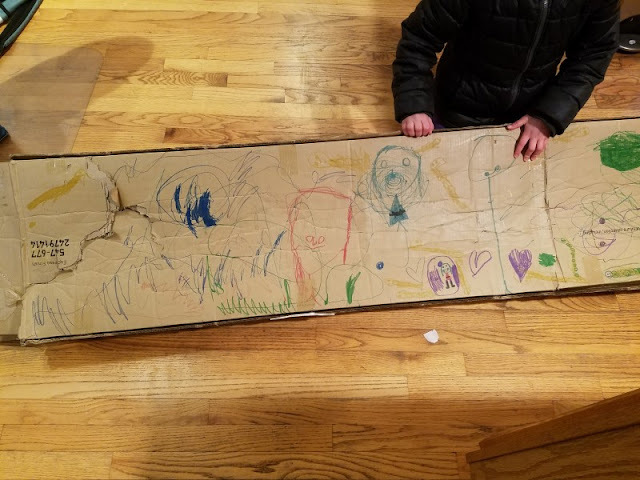 I went to go make dinner, smiling at how wonderfully creative they are and thinking, "Well, we can keep the box around if they like it so much." The box went to the recycling center the next day. Those big events are a lot of work to put on. But then all the money raised goes to the school instead of some company. Well worth it! Love #1!! All your friends and neighbors will thank you too!! Just the title of that math book made me laugh! Who knows, I might even read it! Read a math book on PURPOSE?? What did I just say?? I think I blacked out there for a second. So, now I gotta Google how boogers form. I learn a lot from you too, Jenny!! I never, ever thought I would ever have anything good to say about a math book. I'm really not that kind of person. If you like it, the same author wrote a bunch of books about math that are probably equally fascinating. For Christmas we got Visions of the Universe for my 14-year-old, which is how we learned about him. That book has pictures (which you can color if so inclined) explaining the intersection between art and math. It requires a lot more parent volunteers (and donated money/items for the raffles,) but we're all willing to pitch in. Not only does all the money go to the school (instead of 50% like in a normal fundraiser,) but it's a family night out where you don't have to cook dinner and the kids have fun playing games. Looks like that "less salt" is both NaCl and KCl. I Guess you're getting your K+ from salt instead of bananas ha. But yes, I won't use that. Just go for the real thing. Oh man my oldest would LOVE that math book! 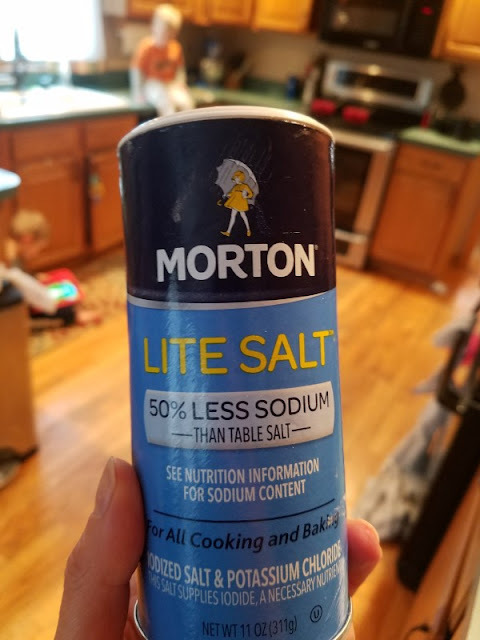 I just read a really long book about salt (I know, but it was actually interesting) and never realized how many different types of salt there actually are! Was it Salt: A World History! I totally picked up that one at the same time as the math book. Also for my teenager, but then my husband picked it up and started reading it so we'll have to wait. Pretty much, we steal all her books and read them first.